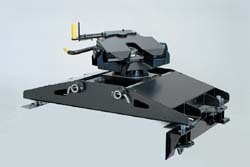 The PullRite Super Glide hitch is the Gold Standard solution for towing with Short Bed tow trucks. The PullRite Super Glide hitch automatically slides the unit back away from the cab of the towing vehicle during turns,without having to stop, move pins or levers, or force the trailer to slide along rails. How it Works: The trailer king pin box is fitted with a capture plate, which engages the head of the Super Glide hitch, so that when, during a turn, the head twists to stay in line with the trailer. As it twists, the patented CamGlide feature moves the head back away from the truck cab. For more detailed information and features, visit PullRite's SuperGlidewebsite. These come in various towing capacities from 12K to 24K. The heavy duty 24K model moves up to 18" while making turns - going forward or in reverse - designed for the largest, heaviest fifth wheel towing applications. It uses no base rails - totally removable when done towing - for a clean bed. These hitches require specific mounting rails/brackets for each and these mounting kits are specific to certain vehicles. See us for vehicle specific installation kits and pricing.